Martin Vavra returns for another episode of the Kaijucast! Why hello there, listeners! I’m all settled in my new place and my monsters are on display in the all-new Kaijucast headquarters (it’s awesome, not only do I have room to display all of my collection and posters, I also have a killer kaiju theater going on here). While I am completely IN the new place, there are still a million little things to do. Because of that I had to modify my own schedule. I just barely got the screen hung and the projector installed in time for this month’s Daikaiju Discussion screening and I need to reschedule my August guest to September or something. 3. “Popcorn Crabula” by Man… Or Astro-man? Tokyo SOS Podcast with Thomas, Jesse and ME! 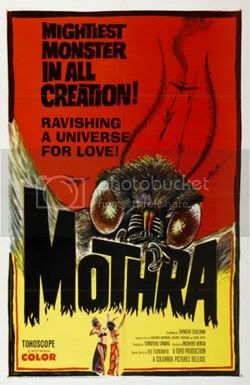 For the month of September, watch the original Mothra film from 1961. This one is a classic film from the golden of Toho’s golden age of SciFi and should be somewhat easy to find since it was part of the ICONS OF SCI-FI 3-disc set that was released by Sony last year. I think we’ll be watching the subtitled version of that film, but since both are included on the DVD, I’ll let the audience decide! Just make sure to get your homework assignments in before the last week of the month. As usual, I’ll compile your thoughts and include them in the September episode. Don’t delay, download today – the twentieth episode of the Kaijucast is right here! Feel free to write me if you have any music requests, are enjoying the podcasts or if you, questions or even ideas for future shows, too – also don’t forget to follow the Kaijucast on Twitter or become a fan on Facebook. We are on both iTunes and the MS Zune Network as well, so if you listen through an iPod or Zune, you should be able to subscribe to the show and have the episodes download automatically to your player.